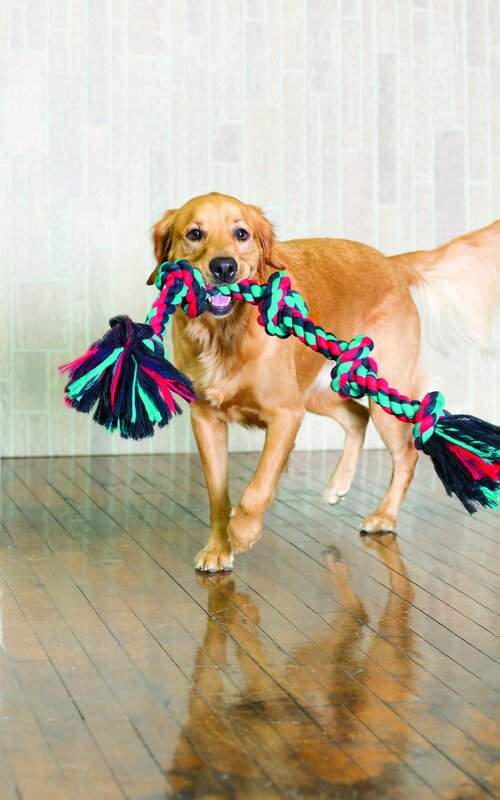 Mammoth rope toys are made from premium materials in fun shapes for dogs of all sizes. Rope fibers floss dog's teeth as they chew and play. Rope fibers floss dog's teeth as they chew and play. Safe, long lasting great for games, fetch and play. 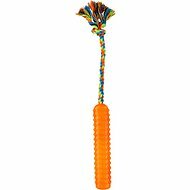 Built strong to chew and play for hours, perfect for teething puppies. Good rope for tug-of-war and daily play. Our has lasted about five weeks so far. Our dog is trying his best to chew through the center and is about halfway there. (We'll just make it two, smaller, ropes then!) I've added it to my auto ship order for later in the year, as I'm sure we'll need another. Highly recommended for rope chewers! My dog didn’t even wait for me to finish pulling this out of the box. He snatched it right out of my hands the second he saw it and was obsessed with it from the start! He loves it so much that he carries it with him from room to room like a security blanket. Needless to say, if your dog is large and is a rope chewer this is highly recommended! this rope is gigantic in thickness and length. The fibers do tend to come out of the fringed ends, and apparently, this is common with rope toys, but I worry a little about the dogs ingesting the fibers, so I don’t really let them chew on it. they love to chase it and play tug-o-war with it, though! My pup loves to play tug-of-war. 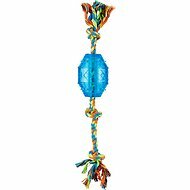 This rope is great in length, has 3 notches incase your pup like to jump up the rope. My pup has a strong grip, its proving to hold well. We love it! Great size and I can see this being a great toy for a lot of dogs. Ours is a destroyer so has decided the only way to play with this is to rip the threads off the end. We are putting this away to bring out again when our pup is older and perhaps a little less destructive. This is a solid rope! My 90lb dog has torn apart several ropes that were given to him, but this one is holding strong! It’s super-sized and super-strong for a big chewer. I bought this for our new rescue dog. She has very sharp teeth and can chew through things easily, though she is not a destructive dog. She seems to like soft toys and really enjoys playing with this one. She gets bored easily and this rope toy has kept her entertained for long periods of time. The rope has stood up very well to her chewing on it. This rope is great. It’s MASSIVE but my 30 lb power chewing Aussie mix can throw it around, drag it around and chew the living daylights out of it. It’s frayed with chewing but not gotten stringy where she can eat it and whatnot.